— 1480: Andreas von Karlstadt is born. — 1483: Martin Luther is born. — 1484: Huldrych Zwingli is born. — c.1485: Balthasar Hubmaier is born. — 1489: Thomas Cranmer is born. — 1491: Henry VIII, Martin Bucer are born. — 1492: Columbus makes first voyage to the Americas. — 1494: William Tyndale is born. — 1496: Menno Simons is born. >— 1497: Philipp Melancthon is born. — 1499: Swiss gain independence; Peter Martyr Vermigli is born. — c. 1500: Hans Denck is born. — 1509: John Calvin is born. — 1509: Henry VIII of England assumes throne at 18, marries Catherine of Aragon. — 1513: Leo X becomes Pope; John Knox is born. — 1516: Johann Froben of Basel prints Erasmus’s Greek New Testament. — 1517: Luther writes 95 Theses; printers spread copies throughout Germany. 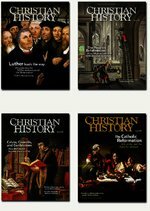 — 1519: Eck debates Karlstadt and Luther at Leipzig; Zwingli begins New Testament sermons; Swiss reformation starts. — 1520: Luther writes To the Christian Nobility, On the Babylonian Captivity of the Church, and The Freedom of a Christian. — 1521: Leo X titles Henry VIII “Defender of the Faith” for attacking Luther’s views of the sacraments; Hadrian VI becomes pope; Luther is excommunicated at Diet of Worms. — 1521: Religious unrest begins in Wittenberg: private Masses are abolished, Karlstadt serves Communion to the laity in both elements, religious statues are destroyed. — 1522: Spaniards complete circumnavigation of globe. — 1522: Zwingli argues his first Reformation debates; Adam Petri prints Luther’s New Testament. — 1523: Clement VII becomes pope; first two Reformation martyrs are burned at the stake in Belgium. — 1524: Luther debates Karlstadt on the Lord’s Supper. — 1524-1525: Peasants’ War fought in Germany. — 1525: Anabaptist movement begins in Zurich; spreads to Germany. — 1526: Reformation spreads to Sweden and Denmark. — 1527: Luther writes against Zwingli on the Lord*rsquo;s Supper; printer Hans Hergot is executed. — 1527: First Protestant university (Marburg) is founded. —1529: Luther attends Marburg Colloquy with Zwingli, but they reach no agreement on the Lord’s Supper; name Protestant first used. — 1530: Melancthon presents Augsburg Confession, a statement of Lutheran beliefs. — 1531: Schmalkaldic League, a body of German Protestant groups, forms in self-defense against Charles V.
—1531: Zwingli dies in battle at Kappel. —1532: Diet of Regensburg and Peace of Nuremberg guarantee religious toleration in face of Turkish threat. —1533: Thomas Cromwell declares Henry VIII’s marriage to Catherine null and void; Henry marries Anne Boleyn. — 1534: Henry VIII declares himself supreme head of Church of England; Paul III becomes pope. —1535: Anabaptist uprising at Münster put down and Anabaptists executed; Thomas More beheaded for opposing Henry VIII. — 1536:First edition of Calvin’s Institutes published. —1536: William Tyndale is burned at the stake; Henry VIII begins to dissolve the monasteries; Anne Boleyn is executed; Henry marries Jane Seymour, who dies in 1537 after giving birth to the future Edward VI. — 1539: Frankfurt Truce is declared between Charles V and the Schmalkaldic League. — 1540: Society of Jesus (Jesuits) is formed; Henry VIII marries Anne of Cleves; marriage is unconsummated, and after divorcing her he marries Catherine Howard; Philip of Hesse enters bigamous marriage with consent of Luther; conferences fail to reconcile Protestants and Catholics. — 1541: Calvin returns to Geneva from exile. —1541: At Conference of Regensburg, Melancthon and Bucer reach agreement with Catholics on most doctrines, but Luther and Rome reject their work; Karlstadt dies. — 1542:Catherine Howard is executed. — 1542: Paul III establishes the Inquisition. — 1543: Copernicus writes that the earth revolves around the sun; Henry VIII marries Catherine Parr, who will outlive him. — 1545: Council of Trent, for reform of the Catholic Church, opens. — 1546–1547: Schmalkaldic War fought between Protestant and Catholic territories in Germany. —1547: Henry VIII’s Protestant son, Edward VI, succeeds him. — 1548: Augsburg Interim makes some concessions to Protestants in Germany, but many Catholic and Protestant leaders refuse to accept it. —1549: First edition of the Book of Common Prayer is published. — 1549: John Knox is released from French imprisonment. —1553: Edward VI’s Catholic half-sister, Mary, succeeds him. — 1554: Knox travels to Geneva and meets Calvin. — 1555: Peace of Augsburg allows German rulers to determine religion of their regions; Mary burns Hugh Latimer, Nicholas Ridley, and Thomas Cranmer at the stake. —1558: Mary’s Protestant half-sister, Elizabeth, succeeds her. 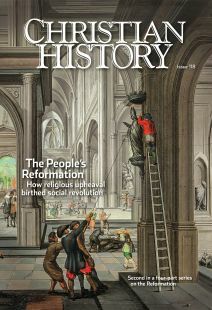 This article is from Christian History magazine #118 The People’s Reformation. Read it in context here! BONUS ONLINE CONTENT: What’s in a name?